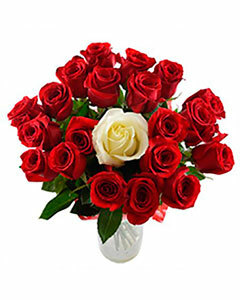 Beautiful bouquet of fragrant roses for the most beautiful, dear and unsurpassed woman in the world! The most important thing is its content. You give your beloved a floral masterpiece and nothing distracts attention from the beauty of the lovely creatures of nature. Roses 50-60 cm. long. 24 red and one white roses, decoration.